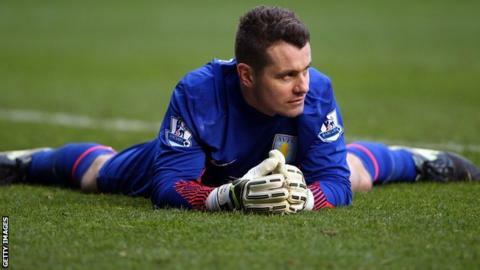 Shay Given believes Aston Villa's off-field dramas will not affect the players as they attempt to avoid relegation from the Premier League. Assistant manager Ian Culverhouse and head of football Gary Karsa were suspended on Tuesday. Club owner Randy Lerner has backed boss Paul Lambert, and Given said the players were focused on survival. "What has happened off the field shouldn't affect them too much," the goalkeeper told BBC Radio 5 live. Villa have refused to state publicly the reasons for suspending Culverhouse and Karsa. But Lambert's position does not appear to be under any threat, despite Villa's slide towards the relegation zone after losing their last four matches, and has been praised by Lerner for his conduct. "Our manager has been faced with some unexpected issues that could have very easily set the club back," said Lerner. "In watching him handle matters, I've seen total loyalty and commitment to Aston Villa." Following the suspensions of Culverhouse and Karsa, Lambert has asked Given and coach Gordon Cowans - a member of Villa's 1982 European Cup-winning side - to assist Lambert. "Being an experienced player, he felt I could help the group," said Republic of Ireland international Given, who recently returned from a loan spell at Championship side Middlesbrough and is Villa's third-choice keeper, behind Brad Guzan and Jed Steer. "The most important thing is the safety of Aston Villa in the Premier League. We have to pull in the same direction." Former midfielder Cowans, 55, has moved up from his job as development coach to help with first-team coaching duties. "Gordon, a Villa man through and through, has repeatedly stepped up to support the club regardless of the task," said Lerner. "Shay, too, has been unhesitating in answering the manager's call. I couldn't ask for more from people who are up for this challenge and the very real obstacles we have to overcome." Former England international Cowans, who made 527 appearances for Villa and helped them win the First Division in 1981, also praised Lambert. "Randy Lerner doesn't like making public comments but even he accepts Villa's current plight by coming out of the shadows. In praising Paul Lambert for dealing with some "unexpected issues", it feels as if the reclusive Villa owner still supports Lambert." "The manager is a winner, a football man through and through," he said. "He knows what he needs in order for the team to go and perform and win." He added: "Our priority is to win football games. That requires determination, passion and the right performance level, but that's what we're about at this club because we have that tradition and we gain strength from that." Given feels Villa's problems on the pitch can be traced back to the surprise 1-0 win over title challengers Chelsea on 15 March. "This is a good group of players but after beating Chelsea maybe we thought we had done enough and took our foot off the pedal," said the former Republic of Ireland international, 37. "If you lost four matches on the trot at any club, confidence will take a hit, but there is a real buzz in training."